Below I pasted a few links with pictures and the map of Waksmund posted originally Polish Highlanders section of PolishOrigins Forum here: http://forum.polishorigins.com/viewtopic.php?p=3254#3254 . Please continue your conversation about Waksmund in this topic for others interested in this village have chance to find all interesting information in one place. I recently joined this site, and I am excited about reading all the wonderful forum input by moderators and visitors (wow! where to start)? Well, I chose this Waksmund post (thanks for starting it up, Zenon), being that it was the home village of my paternal grandparents: Jan Zwijas and Katarzyna (nee Niemiec) Zwijas (--aka John and Catherine [as so many immigrants did, Grandpa "anglecized" this surname at Ellis Island to its current version, which we went by thereafte]}. I have only done informal geneology research, but have discovered that our more rare Zwijas surname (settled in Waksmund/Nowy Targ) is definitely related to the more common Zwijacz surname (settled in/near Zakopane)--by root word, and by people. In fact, with a stroke of luck, I made a contact in Zakopane (while surfing the Web!) with a distant relation, who read an area geneology book, citing our surname lineage, and found that we shared an identifiable common ancestor from 1615! Klemnica Ciagwa (read w. dialectic mark), came into the region (first mentioned, around old Zubsuche, now Zab and Suche) and married into one of the founding families of Podhalia, the Gasienica clan! (this surname is even rarer, so, I have only conjecture so far, in going back further-- he may have migrated into Podand from Slovakia or thereabouts???). I have the name Zwijac in my family tree: A Zwijacz, Rafal, farmer, was godfather to one of my ancestors, Ludwika Rol (b. 1905 in Banska) on December 5, 1905 in Banska (now Szaflary-Banska). The information is from the Szaflary church records. You said that your paternal grandfather was Jan Zwijas. I found a ship manifest for a Zwijas, Michal (misspelled Zivijas, Michal) from Waksmund, 24 years old, farm laborer, single, who traveled to the US on board of the SS Bremen that left Bremen, Germany on Oct 27, 1906 and arrived in New York on Nov 8, 1906. The passenger record indicates that he was going to Hastings, PA to join his brother JAN ZWIJAC (your grandfather??). His place of birth is given as Waksmund. He traveled with Stephan Sral from Waksmund, 24 years old, farm laborer, single, who was going to join his brother Antony Sral in Hastings, PA.
As to the name Gasienica, Bill Rushin, the moderator of the "Polish Gorals" forum, has Gasienica ancestors in Podhale, you may want to get in contact with him. I've been reading all your exchanges and input here, but nice to meet you via this exchange! And, thank you for your detailed information about Zwijas/c/cz (unfortunately, I know very little, if any Polish (and certainly no Gorale dialect), but, do realize these various endings are pronounced differently, and also, if a diacritical mark attends any vowel or consonant. So, likely the "c" got transposed to the sound of an 's" when they arrived in the U.S.? Yes, I am sure this Michal is my paternal grandfather's younger brother. I had learned of a Michael who came here after my grandparents had already arrived and settled in PA. He had lived with them for a short while, but, he "didn't like it here" and went back to Poland, where we lost track of his existence. But, I never got the actual details (dates, ship, travelling companion, occupation, etc. )...until now! So, thank you very much for this. For one thing, I had never heard any of my relations coming through "Hastings" (all I knew was, they'd all settled near Pittsburgh, PA, in the counties/towns of the Portage, Johnstown area. The Sral's I did hear of...but again, not these details you mentioned....I'd learned that the Sral's were good neighbors/friends of my grandparents in Poland AND later, in PA (in fact, I know my grandmother (and, I assume, grandad too) travelled with these Sral's on their voyage 'over the Pond'. But, I'd never heard mention of any siblings of the Sral's-- as likely, this Stephan and Antony, you mention, were. By the way, since you and Bill are using your own names here, I will give you that option too (besides, I realize I mispelled the Polish in concocting my username, but too late to change it: I guess it ought to be PanieKochanie instead of PaniKohani (and I'm sure it's different still, in Polish! )...anyway, you may also refer to me as, Stephanie, if you wish; whatever suits your fancy ! My husband's family name is Schall and we're in central Pennsylvania. His great-grandparents were also from Waksmund, Stanley Schall and Antonia Rogal, and came to the US and settled in Clarence, PA where Stanley was a coal miner. Today I was shown their marriage registry from St. Michael's in Clarence, where they are named Stanislaus Szal and Antonina Rogal. I saw many variations of his last name including Szal, Sal, Saal, and even Saljan. Who knows when it evolved into Schall! Anyway the paternal parents were Jacobi and Annae Szal, and the maternal parents were Alberti and Mariae Rogal. I believe this record was written in Latin, hence the vowels on the ends of the first names. I'd love to know more about the folks who stayed in Poland. My husband's family name is Schall... His great-grandparents were also from Waksmund, I'd love to know more about the folks who stayed in Poland. Your village is just west of Nowy Targ. 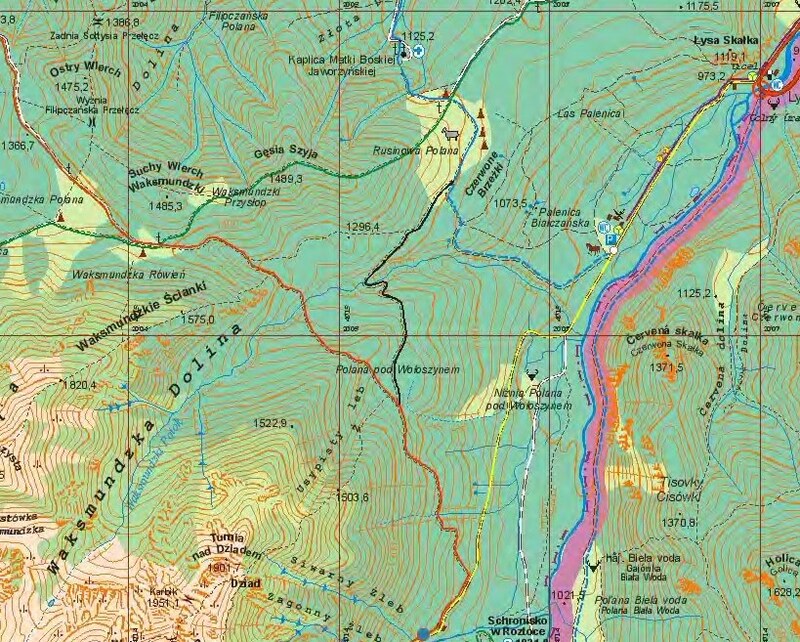 (I indicated where the other map above shows the Wakmundzka Valley location). I am directly related to Scislowicz and Wielkiewicz families of Nowy Targ. I am also related by marriages to Sral (later Schall in Hastings, PA), Beltowski, Waksmundski, Batkiewicz, Domalek, and many others.....all from the Nowy Targ/Waksmund region. I also have a colleague here in the Schenectady area that is related to Sral. There are many of the unique Nowy Targ surnames in cemeteries here in Schenectady and Saratoga Springs. RE: Paternal grandparent's surnames: Shrall/Sral/Srall and Ligenze/Ligenza/Ligeza-- village of Waksmund. I believe the Shrall's and Ligenze's (with spelling variations) lived in Waksmund and emigrated to Cambria County Pennsylvania between 1895 and 1900. A cousin thinks she has the name of the church in Waksmund where my grandmother was baptized. I plan to visit Europe next summer and am including a trip to Poland to visit Waksmund as well as Boleslawiec and Brzyskowzystwo where it's possible my maternal grandparents were born. Is there a cemetery in or near Waksmund that I can walk through looking for family members? Is it possible to check church records that date back to the early 1800's? I've never been on a search like this nor do I speak any Polish to ask questions when there. RE: Paternal grandparent's surnames: Shrall/Sral/Srall and Ligenze/Ligenza/Ligeza-- village of Waksmund. ......Is there a cemetery in or near Waksmund that I can walk through looking for family members? Is it possible to check church records that date back to the early 1800's? I've never been on a search like this nor do I speak any Polish to ask questions when there. Also, in the forum section 'Emigration' you'll find a list of Waksmund villagers who arrived in the United States. Maybe you will find some familiar names. In one of the picture that I have of the cemetery in Waksmund one of the graves in the background is of an Anna Sral. This is someone different then the memorial that Bill is talking about. Sorry for being away from Polish Origins. I was kinda upset that my father (Leo)'s cousin Stella (NY) passed away before Christmas. She is daughter of Amelia Waksmundzki Huzior. She was 94 yrs. old. I am lost for more informations from her. Now I will keep visiting you again. Thanks Arlene, Cyrwus, Ute and Bill. None of the Sral and Ligeza names match up to my known family but it's likely there's a sibling among them that stayed in Poland after my grandparents emigrated to the United States. I have uncovered a little more information since my last post and hope to do a little detective work this summer when I visit Waksmund. My grandmother Mary Leginze (spelled Legenzy on the 1920 US census but was probably Ligeza) was the oldest of 10 children born to Jacob Ligeza (b 1864) and Ludwin Sral (b 1872). Mary(b 1895) was the only child born in Poland. The second child Anna was born in Cambria Pennyslvania in 1899. The 1920 census indicates that Jacob arrived in 1899 with his wife and daughter coming later in 1900 which is possible only if Ludwin was pregnant with Anna. My grandfather Frank Sral (Frank is probably his Americanized name, not Polish) was also born in Waksmund in 1885 with his entry on the 1920 census indicating he emigrated in 1907 also to Cambria. Mary and Frank were married in 1912 in Pennsylvania. We believe that both of my grandparents were baptized in St Hedwig Church. I only have the name and assume this church in in the vicinity of Waksmund. It's been interesting and frustrating trying to track down clues for the relatives. Both first and last names changed on each census from 1900-1940, probably in the beginning due to the fact these people didn't read or write so the person taking the information wrote the name based on sound. I'm hoping to discover more records in Waksmund that could shed light on any of the siblings of Jacob and Ludwin who probably remained in Poland. There were many names on the gravestones you generously posted having birth dates in the 1890's so they would have been about the same age as my grandmother. I've never been on a search like this before so I'm at a loss how to begin tracking down old records when I get to Waksmund. Any suggestions? My Polish is non-existent. I had the wonderful opportunity to visit Waksmund in June 2014 with Zbigniew, a guide from Polish Origins. He did some preliminary research before my arrival in Waksmund and had made an appointment to meet with the parish priest to look at records. It was a dreary day with fog and light rain as we drove from Krakow to Nowy Targ to get some house information from the civil office. We had old house numbers that we converted to plat numbers which is the way properties are identified on the parchment-like maps dating back who knows how many years. We located the plats where my paternal grandmother's family Ligeza lived on one side of the river and then the grandfather's house on the other, closer to the church. At lunch we used Google earth to try to estimate the GPS coordinates and afterward went for a look. People in Waksmund recognize cars that don't belong. On our first stop about 3 different people came out of their homes to take a look. They were pretty sure that one of the homes on the block belonged to the Ligeza's but weren't sure which one. They said if we came back later (this is all in Polish of course), a neighbor who was 100 years old might be able to help. They were all dressed in wool pants with holes, rubber boots and very old plaid flannel shirts. It was time to go to the church and after a little tea and cookies we all went to the basement where the priest opened a very large cabinet that contained probably 20 or more record books dating back to the 1700's. Since we knew the approximate years we were able to zero in on birth, marriage and death records. During this process Zbigniew discovered 2 more generations back from my brick wall. We probably could have located more data but father had to say Mass. He was very generous letting Zbigniew take photos of the important pages. As we were leaving the priest told us that the grandson of my grandfather Franizcek Sral's brother Jan lived near the church. I never knew that he had a brother as he died many years before I was born. We all walked over and the man who answered the door bore a striking resemblance to my father. His name was Leon Kuras and would have been my dad's first cousin. It was very eerie to say the least. Leon told us that his brother Karol lived with 3 of his children a few doors away. The house we walked into was built in 1927 replacing the stone structure my grandfather Frsnciszek Sral was born in. With some kind of crazy luck we found the place my grandfather and who knows how many previous generations were born, lived and died. Leon and Karol's father was Jan Kuraś married to Helena Sral, daughter of Jan Sral, my grandfather's brother. Jan's brother was Jozef Kuraś of Polish Liberation fame. The Kuras brothers knew that their grandfather went to the United States but never knew where, only that he was a miner. We were able to tell them that the two brothers went to Portage Pennsylvania in Cambra County around the turn of the century and worked in the coal mines. The majority of people in Waksmund carried the same surname with Sral being the most prevalent. Some Sral's changed their names to differentiate themselves and others changed it because according to the guide, it was a word that sounded like or was a bad word in Polish. That part was lost in translation. There were Sral's on the Ligeza tree along with many Waksmundzka's, Rogal's and Garbacz. It was quite a remarkable and certainly unforgettable 12 hour day going back in time in this little village in the middle of nowhere.